A project older than the blog, a section of Peace Street has been marked for upgrades for over a decade. Buried power lines, more street trees, and new sidewalks could happen soon for the section between St. Mary’s and West Street. There was a good overview of the project, including its history, during a recent city council meeting and I have the presentation and discussion for you here on the blog. If the embedded video isn’t showing for you, watch it here on YouTube. The project’s main goal is to improve vehicle and pedestrian safety. The street will also get a few aesthetic upgrades with street trees, new crosswalks, and new signal poles. One interesting piece of the project that we can pull from the discussion is the work to decrease the number of driveways in front of Peace Street Market and Fallon’s Flowers. Simply put, the solution presented would have been a one-way driveway across both shops with angled parking. This is similar to spots on Hillsborough Street such as the Fedex/Gumby’s lot or the Wells Fargo. 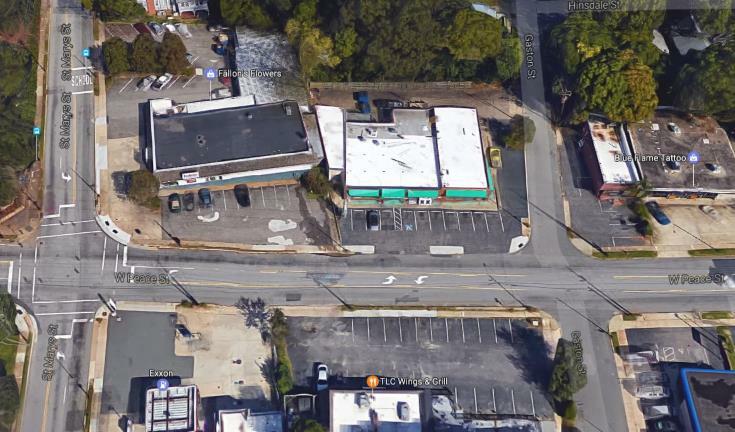 Google Maps aerial of the 800 block of West Peace Street. Click for larger. Fallon’s Flowers did not support that so the plan isn’t happening. At the same time though, it was mentioned that the property was sold recently and perhaps plans for redevelopment are taking place. There are no public plans at this time for that lot. This project, Peace Street West, should take place at the same time as all the other construction along Peace Street, including Smokey Hollow and the Capital Boulevard bridge, so expect a ton of activity in the area over the next few years. As much as MaryAnn Baldwin’s comment was self serving, it raises a good point. With each of these comprehensive streetscape plans or other significantly scaled projects like South Street, there should be cross communication with the team that is developing the bike share program and make sure that stations are integrated into the design where applicable instead of being an afterthought. That said, I am not so sure that Peace is the street that we want to encourage cycling with a public program given its narrowness, blind(ish) hills, crowdedness, etc. Well, lets just shrink all the streets to two lanes and up the rents to $1,200 for a loft!!! The bikeshare program/vendor contract is out for bid right now, so the exact siting and such has not started, but should be fairly easy to work into these plans. I’m glad that Peace Street will finally see some improvements. But I agree with John352 that it is not the right street for bike infrastructure. It’s one of the few East-West connectors that is (moderately) fast and efficient for vehicle traffic. We should preserve a few of this kind of street–particularly on the periphery of downtown. John532, it sounded like BPAC was involved and they determined it wasn’t viable. I agree that Peace is a little tight west of West St and I’d be fine with no improvements from West to St. Mary’s as you can take Johnson pretty easily if needed. I do think Peace should absolutely be bike friendly from West St. to Seaboard, though, as there aren’t any good routes to cross Capital around there. That may already be planned though. I am not a regular downtown biker, but say, several times a month I am out day or night and in traffic…with bike lanes already along Clark and Peace @ Broughton, and coming to Peace from West to Capital, I’ll just take the lane from St Mary’s to West and be on my way. Cars will just have to get used to it as many other bike folks feel and do the same already on that stretch, bike improvements or not. Already as a pedestrian, in the main downtown grid, I don’t take crap from any car and regularly stare down anyone turning into my crosswalk and make them wait a tad longer. Cars should be and will be secondary to any downtown experience I am a part of. Any car that challenges that will be in jail later that day/night. @Bruce, I agree that Peace from West St. to the east should include infrastructure for bikes and I agree that Johnson is a better route for bikes from West St. to Cameron Village. Not only is it basically flat, it’s also mostly residential in nature. That said, there are two obstacles to overcome. 1) To safely traverse Johnson on a bike, either lights or 4 way stops are needed at its crossing with Glenwood, Boylan and St. Mary’s. I am not sure that the driving public would stomach such a “sacrifice”. 2) Johnson through the section of Cameron Park is a one way street. To make it work, the road would probably need a sharrow going westward and a dedicated bike lane heading east against traffic. To do this would most likely eliminate street parking on the south side of Johnson. Again, not so sure how the public would react to this “sacrifice”. The other option would be to just let people ride bikes the wrong way down the street. I suspect that it happens already. A third option would be to let eastbound bikes have a lane against traffic for the first block along Edna Metz Park then follow E. Forest Drive to Park Drive and continue on toward St. Mary’s. Peace Street isn’t too tight and cars need to slow down across the board. Raleigh drivers are the worst – it is less stressful to drive (walk) around New York City. I do agree though, maybe this money would be better spent elsewhere. Wilmington or S. Saunders perhaps? I love my neighborhood just south of Downtown but all the Jackoffs commuting through my neighborhood back to Garner need to slow the frig down. 45 mph roads through residential areas is too much. North Carolina is #4 behind Texas, Florida, and California. @Josh. As both a cyclist and a resident in the corridor, I think that there is validity to what you say about the driving habits but there are also some significant physical barriers to safe cycling along sections of Peace Street. The stretch between St. Mary’s and West is particularly challenged because of hills, blind spots vis-a-vis driveways and it is actually narrower than the section to the west of St. Mary’s where bike lanes already exist. Perhaps the bike infrastructure can head east from CV along Cameron/Peace and turn right on St. Mary’s and then left on Johnson until West St. where it can again rejoin Peace at the Smokey Hollow project or continue to head north on West St. to parallel Capital. West bound traffic toward CV can take a similar route but use Johnson St. to Smallwood and into CV? I meant Clark/Peace, not Cameron/Peace. I ALWAYS mix up those two street names. It must be because they both start with a “C”. Also, cyclists heading west toward CV can take Johnson to Bellwood into CV after it crosses Peace/Clark. We should generate excitement regarding these complete street projects proposed by the city. Yes, they seem to drag their feet regarding completion, but look at the amazing improvement to Hillsborough St. and Sandy Forks Rd. Imagine the Capital/Peace St bridge, Smokey Hollow and Peace St. improvements all completed and it’s very optimistic for the entire Glenwood south area. 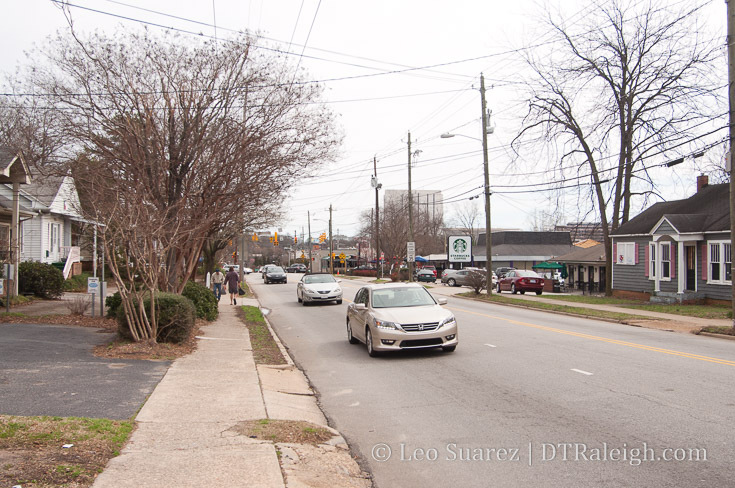 ultimately all of the improvements should vastly improve the corridor and the perceived “reach” of Glenwood South and its connection to the Capital District. Along with infrastructure work by the city and the state, the associated private development in the corridor is going to make a huge impact to its urban credentials. I fully expect that the Smokey Hollow project is going to accelerate development around it as developers push to be part of the game. How much interest would there be to put a velodrome in Devereaux Meadows. It could be as simple as the MellowDrome in Asheville, or step it up a bit like the Giordana Velodrome in Rock Hill SC, or go big like Dunc Gray in Sydney Australia. The facility could also be the home base for the bike share program. Clarity on the Jones/McDowl….car was turning from Jones to McDowell through the crosswalk I was in. Enjoyed reading the comments on this as I use to ride to work downtown but almost got killed as someone ran a red light. @mark I don’t won’t to be dead right. I now drive and park in a deck. I almost ran over one of Jimmy Johns freaky fast delivery person on a bike as I came out of my deck looked both ways and there he was, WRONG way on wilmington street and not even in the bike lane going the wrong way. I think he wet himself as all he saw was full size truck. Some roads as Wilmington and Peace are not good candidates for bike lanes. Too many idiots texting and not paying attention then the bike lane just ends or the vehicle lanes shift and no one can stay in the lanes now. Make Johnson Street both ways. I use to live On Boylan and walked up Johnson to CV beautiful neighborhood street. BTW One Glenwood and Smokey Hollow moving fast!!!! Havent been over that way in about 2 weeks. Have they started clearing land at those two sites? @JimMck – I have to say that I find your idea of building a velodrome at Devereaux Meadows intriguing. I checked out pictures of the facilities you mentioned. Also watched a few Youtube vids of races. Really awesome. An outdoor facility like Giordana Velodrome would be a great place for folks to gather, watch/participate in races and then head over to Glenwood South. Plus, in a way, construction of a velodrome would restore the original/historic use of this property as a sports venue. I think you should share this idea with Sig Hutchinson. He’s a Wake Co. commissioner now but was/is very active in the Triangle Greenway Council and is a huge biking advocate. I’m sure he’d know the best folks with the city to contact to get the ball … ummm … wheel rolling. I’d almost bet my life that Johnson is one way street to prevent it from being used as a short-cut from CV. There is a way around it though for cycling and making it two way while preventing it from being used a short-cut. Just block the east bound entrance from Peace Street while allowing a narrow bike line to access it. This is a strategy that was used successfully in Miami Beach on Alton Rd to southbound Bay Rd. Cars cannot turn right onto Bay Rd. but bikes can. I would also love to see a Glenwood South street improvement plan. They finally came in and fixed some of the bad spots on the road, however I would love to see a plan that improves the entire street and side walks.. similar to what they did with Fayetteville St. years ago. I hope that a solution for parking at Peace Street Market can be found. The gradual elimination of driveways on Glenwood Avenue makes a big difference in the pedestrian experience. I wish we could just move the buildings closer to the street. @CX, the solution lies in that property being redeveloped and the city holding firm to its promise more than a decade ago of assuring a walkable, urban experience. I’ll add that in its first test of that promise, the city failed miserably by allowing a suburban McDonald’s to be plopped down on a very prominent corner along that corridor. I won’t believe anything until I see it from now on. I’d love a velodrome but this is a low lying floodway/plain and I’m 99.9% sure new hard surfaces will not be allowed within that boundary. Much of the stream corridor along Pigeon House is being restored using Federal storm water funding ( also 99.9% sure) which mandates restoration guidelines and specs. Sounds like a better idea for Dix…? Downtown getting a new YMCA in the old Wachovia building. YMCA taking 26,000 square feet. Uncle Jesse , I think this is Super ! Thanks for the info. !